We are one of the most popular professional pickleball paddles in the market. Our cutting-edge manufacturing techniques are the next generation of pickleball technology. High-tech polymer honeycomb can provide excellent power and control. The graphite hitting zone and power comb technology offer high-speed performance while maintaining the power. Each pickleball racket includes edge guard which helps provide protection on ground hits. Pickleball racquet has 4.25 inches perfect size sweat absorbent cushioned grip for long-time play ing. It allows for wrist action, spin, power and quick hand changes. With a lightweight of 8 OZ, Niupipo pickleball paddle offers the perfect balance in great gameplay, control, power. It is suitable for everyone regardless of gender, age or skill level. Niupipo pickleball paddle is made from tough durable materials and manufactured with high quality standards in order to make sure its power, comfort, beauty and stand the test of time. It can provide you better gaming experience with this high quality graphite pickleball paddle. MORE POWER & MORE CONTROL - Our pickleball racket is composed of a graphite-honeycomb for an ideal level of strength and stiffness. It is a great combination for easy control and powerful hitting. Your shots will be more accurate. There will be much more control over the force you put into the pickleball. 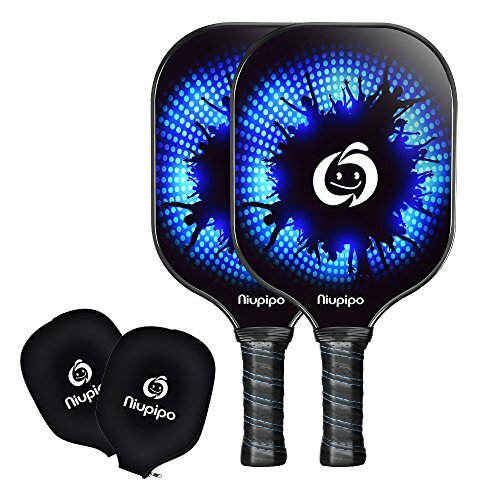 This Niupipo pickleball paddle increase the compact of your powerful hits. IMPROVED STRENGTH BY THE HONEYCOMB CORE - Our pickleball racquet is composed by polymer honeycomb and two sheets of durable fiber glass. This paddle offers great energy to spin the balls. This paddle is made of exceptionally durable material that allows it to withstand strike from balls. Utilizing the best honeycomb cell technology, this paddle will help you win any challenge on the court. PROFESSIONAL SELECTION OF PICKLEBALL PADDLE - We use the best graphite and professional design to make sure Niupipo pickleball rackets are light-weighted and softly edged. They are examined for wide spread surface impact. The surface of pickleball paddle has superior grip for putting extra spin on the ball. It can provide a resilient surface with sound consistency. Pick up this 8oz graphite pickleball paddle and enjoy our game! COMFORTABLE AND ERGONOMICALLY DESIGNED GRIP - This paddle is comfortable and easy to hold. Each pickleball paddle features a specially designed grip that minimize slipping while maximizing the balance. It also offers additional comfort and control to every hit. There is a black edge around the periphery of the pickleball racket in order to protect its edges as well as balance your paddle. HELP YOU WIN YOUR GAME - Having a high-quality graphite pickleball paddle can completely transform your game! This pickleball paddle made with a high-tech polymer honeycomb and sealed with an glass fiber surface. This paddle is not only strong, but also thin and light. High quality, optimum mechanical performance, super lightweight and easy to use. Niupipo pickleball paddle will help you win more games and enjoy your time on the court. If you have any questions about this product by Niupipo, contact us by completing and submitting the form below. If you are looking for a specif part number, please include it with your message. Courtmaster Pickleball 31" Net - Top Selling Net!